Cut Spessartite from Loliondo, Tanzania. Spessartine was first discovered in the Spessart Mountains of Germany from which it derives its name. North-west Namibian spessartine, near the Angolan border at the Kunene river – discovered in 1991, enchanted the world and put spessartine on the map as a major gem material. Marketed as Hollandine garnet first, later as Mandarin garnet. Stones occur in a mica schist. A pure orange color, sometimes with a brown secondary hue. Rather large stones have been reported to have been mined there (up to 50+ ct). Clean stones are uncommon as are stones riddled with small colorless fibers of tirodite which cause a sleepy look. Rather pure spessartine garnet (up to 80-90% spessartine), clear Mn3+ spectrum. Nigeria – near the city of Ibadan. Initially a by-product of rubellite mining, the deposit became a major source for bright orange spessartine from 1998/99 till around 2001. The quantity of stones coming from this locality has decreased since 2001 but (German) dealers still report new parcels being offered for sale. Loliondo, Tanzania – Discovered in 2007, initially mined by individual miners. Turned into a mining claim in 2008. 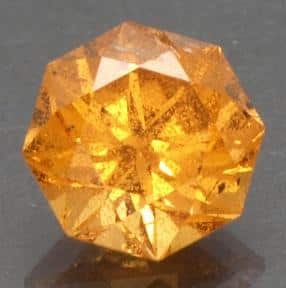 Yellowish-orange color, clean stones are rare, sugar-like and double refractive crystalline inclusions common. USA – Reddish garnets that are technically spessartine are found nearly Ely, NV along with Almandines. Similar stones come from Ruby Mountain near Nathrop in Chaffee County, CO. The Little Three Mine, Ramona, San Diego CA produces very nice classic spessartines maybe over-rated compared to the brighter vivid orange Tanzanian color. Most stones were medium dark orange with brown overtones common. Similar to much of the material from Nigeria, only rarely as clean. The current owner is Louis B. Spaulding, Jr., who also did the majority of the mining during the main production years (1970’s). These days, no mining is really done as operating costs have become so high that it is unprofitable to work the site. Other famous U.S. spessartine locations are the Rutherford Mine, Amelia, VA. Avondale and Jenkintown, PA which have produced large red spessartine crystals. A third American historic source is Haddam, CT.
Brazil – The Navegadora Mine near Conselheiro Pena in Minas Gerais, Brazil briefly yielded deep red spessartines on albite. There are other locations in Minas Gerais as well as in the states of Paraiba, Bahia and Para. Madagascar – Fine spessartines are produced in Madascar. Africa, at several locations. China – A newer spessartine location producing bright orange to red to almost black crystals (some of which may not be spessartine) is Tongbei, Yunxiao County, Fujian Province, China. This locality has been producing good mineral specimens since about 1998. Pakistan – A gemmy spessartine trade-named Kashmarine is found at Donga Nar in Pakistan. Pakistan also produces bright red to red-orange spessartines in the Shengus area. Afghanistan – Spessartine on spodumene is found in Afghanistan in the Pech Valley near the village of Khana Khana, and at Nashai, as well as Mawi in the nearby province of Laghman. It’s likely spessartines will be found at many other Pakistani and Afghan locations. Japan – The purest known spessartine (97 molecular percent) comes from the Kinko Mine, Yamaguchi Prefecture, Japan. Other – Sri Lanka, at Mine-lon; Myanmar, at Mogok; Southern India. Dark yellow to orange-red spessartines are found at San Piero in Campo on the Italian island of Elba; at Ifeld in the Harz Mountains, Germany; at Haute-Vienne, France; St. Marcel near Torino, Italy; Rostol near Arendal, Norway; Vester-Silfberget near Dalarne, Sweden; the Scottish Highlands; and Miaks in Russia’s Ural Mountains. Spessartine from many of these locations is not gem-grade; neither is it all orange. Spessartine is very rarely encountered in antique jewelry since the main deposits have been discovered only recently.